Ever since Bud Selig replaced Fay Vincent as MLB commissioner, he and White Sox owner Jerry Reinsdorf have been seen as allies. 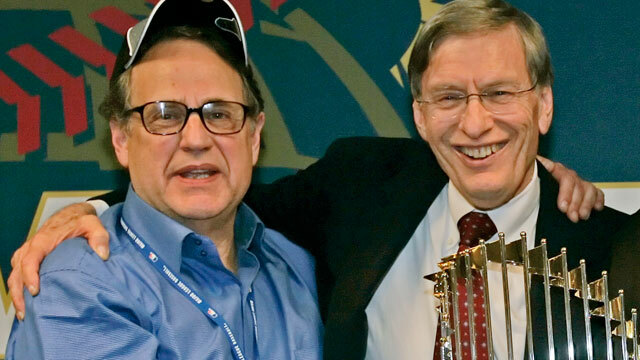 It was Reinsdorf who helped Selig take over the job in the first place, and it was Reinsdorf standing right by Selig’s side supporting him during the 1994 player’s strike that cost everybody a World Series. Since then, Jerry has always had a direct line to the commissioner’s office, but Bud Selig is scheduled to retire in January, and his succession plan is causing some cracks to show in the foundation of their relationship. The New York Times wrote about the succession plan for Selig on Thursday, and while there isn’t a public search for Selig’s replacement, Selig has made it clear whom he wants to take over: his deputy Rob Manfred. It appears Reinsdorf isn’t exactly supportive of the idea. But as Mr. Selig’s final season unfolds, Mr. Manfred’s candidacy is meeting turbulence from an unexpected antagonist: Jerry Reinsdorf, the 78-year-old owner of the Chicago White Sox and long one of Mr. Selig’s most loyal allies in the game. Mr. Reinsdorf has broken ranks and tried to upend the plan to slide Mr. Manfred into the commissioner’s office on Park Avenue, several owners say. In discussions with other owners, Mr. Reinsdorf has raised questions about Mr. Selig’s transparency as commissioner and argued that Mr. Selig should play only an advisory role in picking his successor. Mr. Reinsdorf argued that, unlike owners who have hundreds of millions of dollars invested in their teams, Mr. Selig has no ownership in the game after he retires. “What I have said about Rob is none of your business,” Mr. Reinsdorf said in a telephone interview, interjecting an expletive. Mr. Reinsdorf said he “had never said a bad word about Bud,” who he said “was the game’s best commissioner.” But he said that he believed that the owners — not Mr. Selig — should be in charge of picking the next one. Reinsdorf is one of several owners that Selig has had meeting with about anointing a successor. The report also says that over the last year Reinsdorf has proposed an idea where he and two others should run the league instead of having just one full-time commissioner, and he’s also asserted that Selig hasn’t been “transparent” enough and he fears Manfred will be much the same way. Of course, there’s also the fact that Reinsdorf fears he won’t have the direct line to the man in charge under Manfred because the two have never been close. Reinsdorf also fears that Mansfred would be a bit too friendly with the player’s union, as he’s been in charge of negotiating collective bargaining agreements. In other words, the same two men who made Selig commissioner (Reinsdorf and Selig) want to decide the next commissioner as well. It’s just this time they don’t agree on who that commissioner should be. As for how this affects White Sox fans, I’m not sure it really will, other than the fact we won’t be hearing Hawk talk about how great Bud is during any games for the rest of the season. This entry was posted in Chicago White Sox and tagged Bud Selig, Jerry Reinsdorf, Rob Manfred by Tom Fornelli. Bookmark the permalink.